Medieval Morsels: Easter is here! Heralding Spring at last. All of Medieval society looked forward to the end of winter, with Easter and springtime to follow and the promise of nature's new growth. For a peasant family the spring season meant new planting, new growth and, hopefully, newly grown tender shoots to help sustain a family that had run down its monotonous winter stock of pickled or salted vegetables. Yuk! Tending the Medieval vegetable and herbe garden. As well as plants such as spinach and lettuce grown as "sallette" or salad crops, the green tops of vegetables such as beets and radishes would have typically been eaten too. And there would have been wild leaves such as dandelion, sorrell, orache and young nettle leaves to forage for! Encouraged by a Ukrainian friend, I did once made a nettle soup having tasted hers. Made from the non-stinging variety of nettle and picked well away from the roadside and passing dogs I hasten to add. It tasted okay I suppose, and I do remember it was a pleasant bright spring green colour. 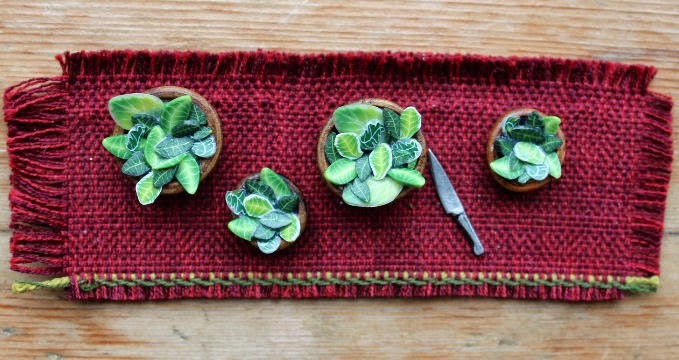 Here is MedievalMorsels' plate of salad leaves, miniature food for a one inch scale period or rustic dollshouse. Medieval “dietetic law” stated that vegetables were a source of disease, especially if eaten raw. Onions, garlic, leeks and cabbage were believed to be an exception to this rule so long as they were cooked thoroughly. In fact the noble classes were advised by the physic (doctor) to “beware green sallettes”. Peasants would not have any interest in such pronouncements by their learned "betters" and would in fact have grown herbes and vegetables behind their cottage, either for the pot or to eat raw. The manor and the monastery would have had a herbe garden too, for medicinal purposes at least. Now traditionally it is also eggs at Easter time that symbolically represent re-birth. Eggs were classified as meat by the church in Medieval Europe so could not be eaten during Lent, What could be done with surplus eggs then? Well, they were coated in liquid fat or wax and set aside to keep (hopefully) until Easter Sunday. Some were coloured using extracts from a range of roots, wild berries or herbs. But how about this for MedievalMorsels' Tudor dolls house dish, which happens to have been inspired by the BBC's dramatisation of Hilary Mantel's Wolf Hall. 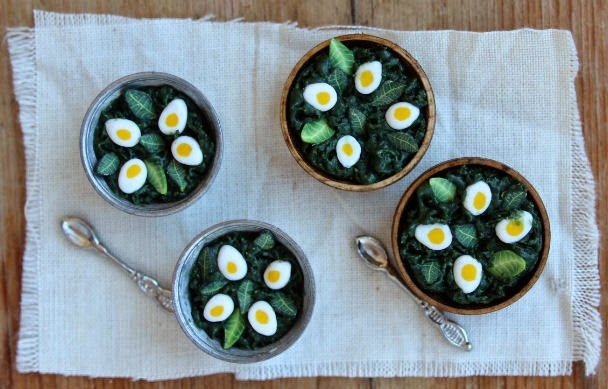 It combines both spring greens and eggs!